Controversial Bird Flu Work To Resume Soon : Shots - Health News Scientists recently sparked controversy when they made dangerous new forms of bird flu. The National Institutes of Health is about to put in place a new system for reviewing this kind of work in the future. A health official culls chickens on a poultry farm in a village on the outskirts of Katmandu, Nepal. 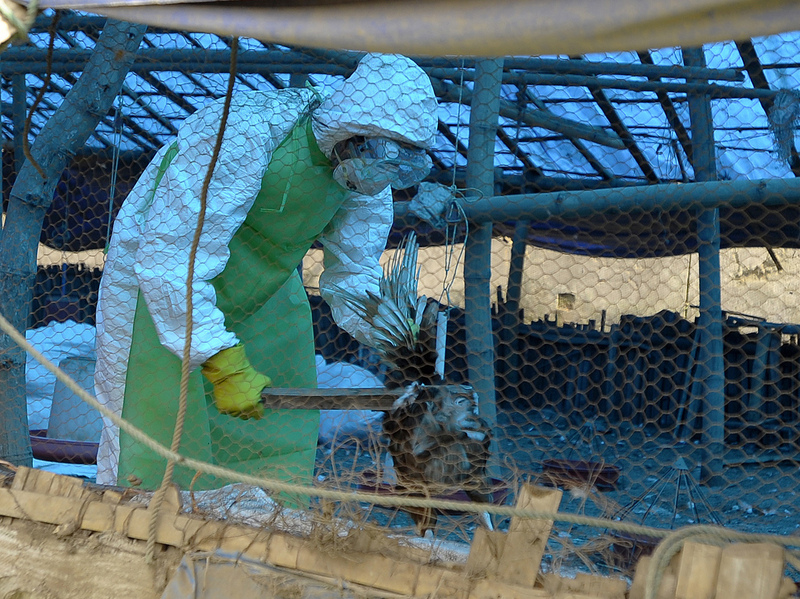 Chickens suspected of being infected with H5N1 bird flu were found in the area in October. Flu researchers may be close to ending an unusual moratorium on some controversial scientific work that has lasted almost a year. That's because officials at the National Institutes of Health say they will be moving swiftly to finalize a new process for deciding whether or not to fund proposed experiments that could potentially create more dangerous forms of the bird flu virus H5N1. Such work has been on hold since January, when dozens of flu researchers around the world voluntarily agreed to a pause that was originally supposed to last 60 days. The move came in response to fears that NIH-funded researchers in two labs had created contagious forms of H5N1 bird flu virus that could potentially cause a pandemic in people, if the contagious germs escaped or fell into the wrong hands. But researchers say the moratorium has stopped work that's vital for understanding how flu viruses found in animals can jump into humans and start a dangerous pandemic. They say these studies are needed to help public health officials get ready for that threat. The NIH has just concluded a public meeting to discuss the benefits and risks. Scientists, public health experts, and security specialists from around the world were also asked to weigh in on a proposed set of criteria that the NIH would use in the future to decide what kinds of experiments could be funded. The government is accepting comments on that draft policy until January 10, and officials indicated that a final version could come soon after. "This isn't something that could be drawn out over a very long period of time," said Dr. Anthony Fauci, director of the National Institute of Allergy and Infectious Diseases, at a media briefing after the conference. He said federally funded flu researchers have indicated that they plan to quickly submit proposals for experiments so they can be reviewed under the new system. "As soon as we finalize it, get the comments, and get it solid as an official framework, then we can just very nicely, I hope, take these proposals as they come in," Fauci said. In addition to this new NIH review system, federally funded flu researchers also need the government to indicate what laboratory safety measures should be required for these types of experiments. That issue has been under review and a decision is expected soon. "That's also on an expedited timeline as well," says Amy Patterson, director of the office of science policy at the NIH. Under the NIH's proposed new framework, research that might create more dangerous H5N1 bird flu viruses would have meet certain criteria in order to receive funding. For example, the experiments would have to address significant public health questions, and there would have to be no less-risky ways of addressing those questions. But some participants at the meeting say they still don't fully understand how decisions would actually get made. "It's critical who is going to do the vetting on this research. Who decides what can be done and what cannot be done?" says virologist Ron Fouchier of Erasmus Medical Center in the Netherlands, whose NIH-funded lab did one of the experiments that sparked the most concern. "If you ask infectious disease specialists about what should be done, you are going to get different answers than if you ask security specialists," says Fouchier. "And so, the committee that would look at grant proposals is absolutely critical in the decision-making process and it's unclear at this stage who that committee would be." Fauci was emphatic on one point — the NIH will not fund a future proposal for this type of flu research unless there's an expectation that the results will be broadly shared. Whether or not to openly publish the details of the two H5N1 bird flu experiments that sparked concern last year was a major source of contention. Some security experts worried that doing so would be like publishing the recipe for a deadly, contagious bioweapon. But public health officials said that sharing scientific knowledge was essential for it to be of any use in pandemic preparedness. After months of debate, both research studies were published in full in science journals. "Our mandate is to do basic and clinical research that adds to the fundamental knowledge that the world can use, so it is completely outside of our mandate to do classified research," Fauci said at the meeting. "When you do classified research, there's automatically a suspicion that somehow there's something maybe nefarious about that. And that's not the space the NIH is in, wants to be in, or ever will be in. We're not going to do classified research." Flu researchers whose experiments get funding from non-U. S. sources may also resume their work. "I suspect that we will be seeing a lifting of the moratorium on the part of people who are not NIH-funded. They will do that according to their own guidelines of their own funders and the country in which they are doing the research," says Fauci, who added that members of that community seemed to be waiting for this NIH conference, though it did not directly involve them. Fouchier says that as far as he knows, all scientists who signed on to the moratorium are still abiding by it, but that most scientists in the Eastern Hemisphere are ready to lift it. "They want to move on with this research because all of the benefits of this research have not been claimed yet," says Fouchier. "And I think that maybe after this meeting we'll have another discussion about moving forward." The World Health Organization is planning to hold another conference to discuss the issues raised by this research at the end of February.